The next example uses the command-line tool wget to obtain a data file from a specified URL7.4. In the example script this line is commented out so the example will run even if you do not have wget (we use the supplied neic_quakes.d which normally would be created by wget); remove the comment to get the actual current seismicity plot using the live data. The main purpose of this script is not to show how to plot a map background and a few circles, but rather demonstrate how a map legend may be composed using the new tool pslegend. Some scripting is used to pull out information from the data file that is later used in the legend. The legend will normally have the email address of the script owner; here that command is commented out and the user is hardwired to ``GMT guru''. The USGS logo, taken from their web page and converted to a Sun rasterfile, is used to spice up the legend. # Assign a string that contains the current user @ the current computer node. set me = "GMT guru @@ GMTbox"
T This script can be called daily to update the latest information. # OK, now we can actually run pslegend. We center the legend below the map. 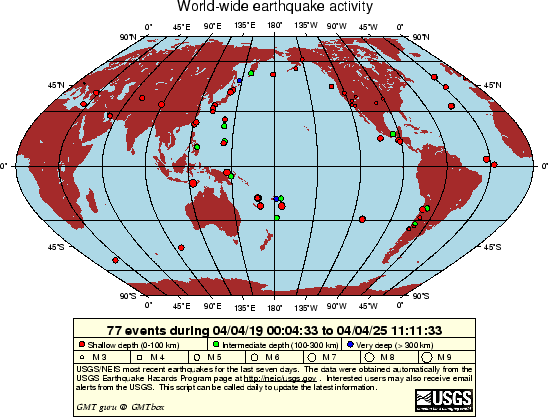 Figure 7.23: World-wide seismicity the last 7 days. The script produces the plot in Figure 7.23, giving the URL where these and similar data can be obtained.